Stuck dynasty! An American icebreaker is now on its way to rescue a Chinese icebreaker which got stuck while trying to rescue a Russian icebreaker which got stuck while carrying a bunch of climate "scientists" on a mission to show Antarctic ice has receded. You cannot make this stuff up. Let's just hope the American icebreaker doesn't get stuck! Excellent: Jade Rabbit spotted by American Eagle. 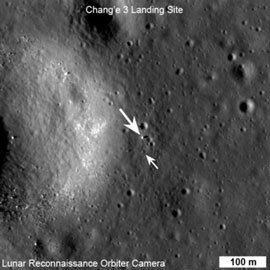 Aka, the America's Lunar Reconnaissance Orbiter snaps a picture China's Lunar Lander and Rover on the surface of the moon. 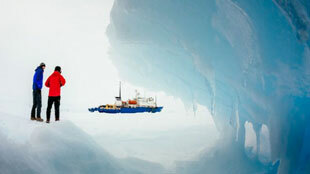 It seems easier to maneuver there than in the Southern Ocean. Galactic Warming! Elon Musk: how we can fix Mars and colonize it. And after that ... Titan? Fascinating: Poor folks can't afford Red Lobster anymore. No question that the "recovery" has not been a rising tide which lifted all boats. One of the best card tricks you'll ever see. No question. Totally stumped Penn and Teller. Marines rethinking pull-up requirement. (It's three!) If everyone is special, then nobody is. Joshua Topolsky: Welcome to the age of the upgrade. "No consumer is surprised when Apple releases a new iPhone, and they are rarely impressed these days by a better camera, faster CPU, or elongated screen. This is not special, this is normal. 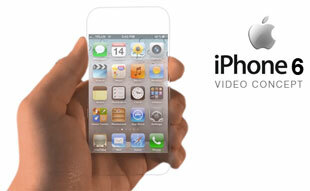 We have now become defined by our penchant and desire for the upgrade." Indeed. Hashtag, twerking, and selfie: most annoying words of the year. I completely agree.